Pro Championships wrapped a bow on the on the 2018 club regular season. Heading into the weekend, there were still plenty of questions to be answered ahead of the Series, and the long weekend did plenty to answer them. The final bid picture was set, some teams struggled through absences, Scandal showed signs of improvement, and yes, Brute Squad was very good. Without any of the other top four teams attending Pro Champinships, it always was likely that #1 Boston Brute Squad would win the tournament without really being pushed late into a game. Their closest game surprisingly came against Washington DC Grit, a 15-11 win in the final round of pool play on Sunday morning, although they had already locked up their pool. Brute were again pushed in the final by Washington DC Scandal. In that game, they took half at just 8-7, with the game on serve. They pulled away in the second half with four breaks to Scandal’s none, but it was the only time all weekend that their game wasn’t in hand early on. Brute Squad’s defense was simply too much for every offensive unit they faced over the course of the weekend. Their defense is the most dangerous weapon in the division right now, and none of the teams best equipped to cope with it were present. Offensively, Brute did suffer through some minor hiccups. But their defense was so dominant that even when their offense was at its worst, they were never really challenged. Ironically though, when asked where Brute could most improve after the tournament, Kami Groom said it was the team’s defense. It would be difficult for Brute Squad not to be a frustrated with the way the tournament field panned out. 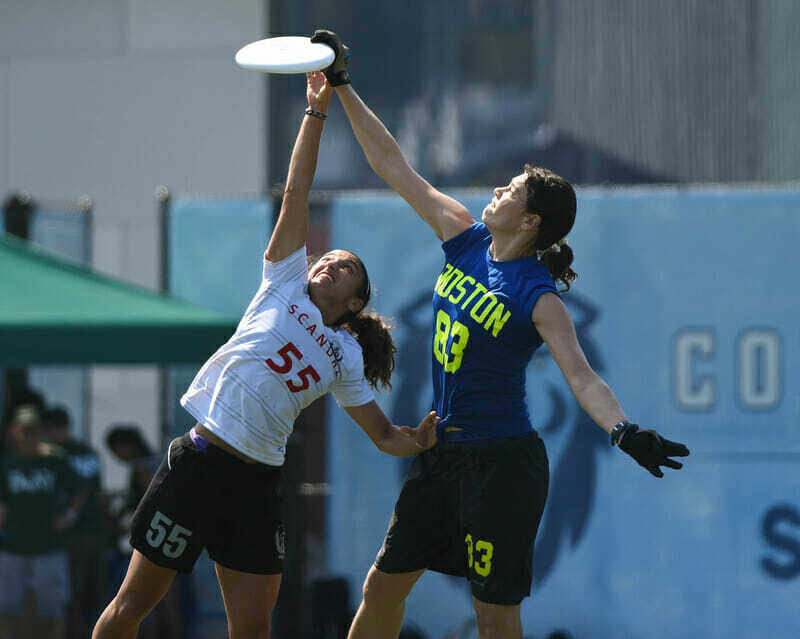 With all of their chief rivals skipping the tournament in favor of the Bay Area Invite last weekend, they missed out on a last opportunity to fully gear up for semis and the final at Nationals. Brute ended the regular season as the number one team in the country, and holders of the first two Triple Crown Tour wins. Even without getting to play the other top four teams, Brute Squad look like the favorites to win a national championship as well. #5 Washington DC Scandal‘s tournament was a genuinely impressive one. They reaffirmed their status as the number five team in the division at the conclusion of the regular season with their undefeated run to the final, and then gave Brute Squad their biggest test of the weekend to conclude the tournament. Scandal’s closest games were 15-11 wins over Boston Siege and Toronto 6ixers. Their game against Siege was probably their worst, as they needed breaks on the two last points of the game to finally pull away. The performance that might give them the most confidence going forward, though, was their only loss. Scandal had already shown an ability to beat teams the caliber of Ozone and 6ixers this season, but they had struggled mightily against the Big Four. They have two losses to Molly Brown by a combined nine goals, and also have a 15-5 loss to San Francisco Fury and 15-3 loss to Brute Squad on their resume. A lot of the team’s first year players had big weekends. Lindsay Soo was impressive all weekend and a key member of the team’s D-line, while also coming over to play O-points at times. Danielle Byers was an a deep threat that teams had no answer for prior to the knee injury she suffered while making the game winning catch against Atlanta Ozone. Laurel Oldershaw earned unders all weekend for both O-line and D-line and was also a threat as a quick thrower after the catch. Scandal’s turnover from last year to this year is well documented, but those new players now seem to really be finding their places in the team. #9 Toronto 6ixers would have loved to be that team to try and push Brute Squad in the final, but they came up short in their semi against Scandal. It was another weekend of missing top players for the Toronto club, with Saraha Bobak, Sarah Kidd, and others missing out. 6ixers had to play Brute in pool play, and when they finished second in the pool, it forced them to have to play in a semis play-in game. Already low on numbers, that game seemed to take its toll on 6ixers in that Scandal game, as they began to make mental errors. It’s a shame for 6ixers that they couldn’t get a full dress rehearsal against the top teams before the series. They have ambitions of making semifinals at Nationals, but they’ll have to do that with a team that hasn’t played together since WUCC. While 6ixers were hurt by missing players, they have very little to complain about from #8 Atlanta Ozone‘s perspective. Ozone were without several hugely important players, including two of their top throwers Paula Seville and Sophie Darch. Kate Travaglini, Emily Lloyd, and Samantha Daugherty all missed out as well. The missed players continue a trend for Ozone, who have had a difficult time staying healthy this year. It’s been a rough season for Ozone in terms of results and injuries, but they did manage to avoid any glaring losses at Pro Champs. Comfortable wins over Bent, Hot Metal, and Siege were expected, but their 15-10 win over Heist in pre-semis was a real sign of the team heading in the right direction. Heist came back a bit late in that game to make the score closer, but Ozone were all over Heist for stretches. Katherine Wooten’s throwing capacity remains elite, while Erynn Schroeder proved to be dangerous operating as a mid-cutter that could attack with her throws or her legs. Those should be a positive signs for a team that’s been struggling to get back to the form that got them to semis at Nationals last year. Pro Championships was an important weekend for many other teams, with several squads on the fringes of the bid picture. #13 Madison Heist did enough to hold onto a second bid for the North Central. Their wins over Grit and Bent were important results, and losing only 15-12 to 6ixers helped save them from losing too many points. #19 Washington DC Grit had an outside shot at earning a bid for the Mid-Atlantic, but they could only do enough to move up to 18th. It’s a shame, because Grit really passes the eye test of a team deserving of going to Nationals. But their weak start to the season was too much for them to overcome. They look like a team very much on the rise, and if they keep the bulk of the roster together should be right around the Nationals picture next season. The most interesting bid result over the weekend was #23 New York Bent‘s win over #17 Boston Siege. The Boston club was closer to the bid cutoff than Bent, and with both teams in the Northeast, it was Bent’s best interest to lose that game by a max score. But they ended up winning on double game point, instead. The game wouldn’t have ended up making enough of a difference anyway, with Siege finishing over 100 points back of the cut off, but it was still notable that Bent elected to play the game as it were any other. Comments on "Pro Championships 2018: Tournament Recap (Women’s)"